Using the right tools is important for doing a great job. Pole saws have many advantages over their more traditional handheld chainsaw cousins. Pole saws have that extra range for reaching up and down, as well as out in front. 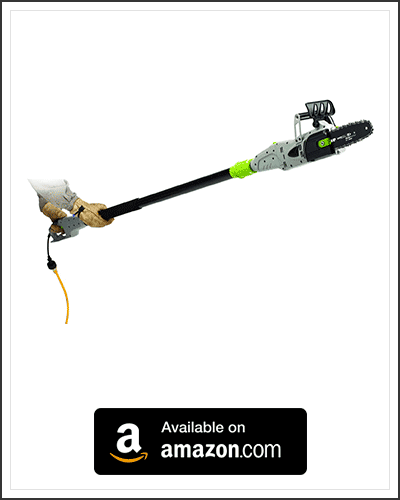 This not only helps to keep the blades away from your hands, it also eliminates the need for ladders and lifts, or having to kneel down when trying to prune those hard to reach low branches. There are several advantages to with using an electric motor over a gas powered motor as well. Electric motors are cleaner and do not produce exhaust smoke, making them ideal to use in poorly ventilated areas. Another advantage is that they only create noise when the blades are activated. So unlike gas powered saws, they do not make any idling noises. 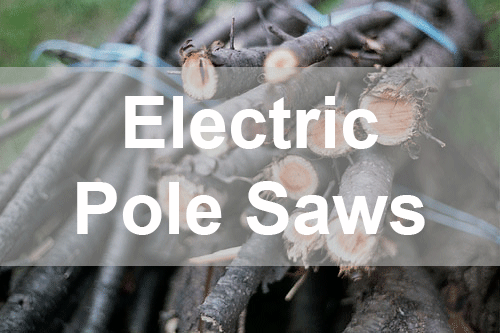 In this article, in no particular order, we will be providing you with reviews of our top picks for pole saws for 2019. Hopefully this guide will help you easily find the best model of pole saw that suits your needs. This little beauty has a one up on many other pole saws, it can be reduced in size to function as a traditional chainsaw, or extended up to 9 feet overhead. 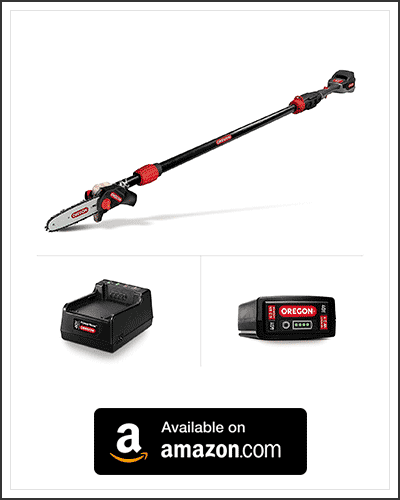 The 6-Amp motor is powerful enough to easily slice through branches that are up to 6 inches thick. The CVPS, comes with an adjustable pivoting head. By adjusting the angle of the head into one of three positions, you can gain even more maneuverability when trying to get at those hard to reach branches. The first draw back to using this unit, is the assembly process. If you are not technically minded or use to assembling your own tools, you may find the instruction manual to be a little confusing. Luckily there is a diagram embossed into the plastic that clearly shows the direction that the chain would need to be fitted. 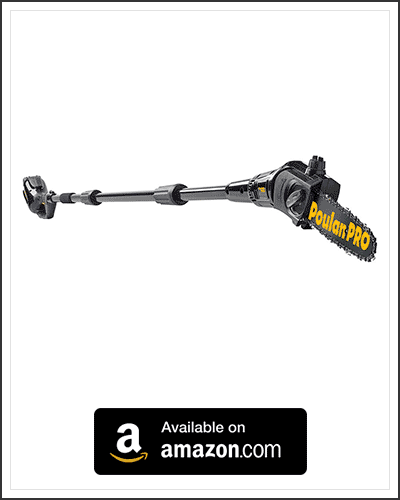 The robust 40-Volt Lithium-Ion battery makes this pole saw an excellent choice for cutting on the go and away from a power source. The G-Max also incorporates an easy to use, chain tensioning system. With a simple flat head screw driver, you can be easily tightened with chain as needed. This makes replacing, and maintaining the chain very easy, and helps to guarantee a smooth and steady cut every time. The battery life is relatively short, allowing for only approximately 65 cuts, making larger tasks almost impossible to do with just the one battery. The batteries are easily interchangeable, so it would be advisable to use a Spare Battery or two if you are looking to do a lot of cutting. One thing that this unit has going for it, is its self-tensioning chain mechanism. It helps to prevent the chain from being too tight or too loose, and can even adjust mid way through a cut. Through the use of their self-tensioning mechanism, they are able to prevent any needles wear and tear to the bar, drive system, and the chain itself. By attaching additional bars to the shaft, you can adjust the length of the pole saw from short to long reach, up to 8-foot long. One complaint we have with this unit, is that the bar/chain guard can be prone to getting clogged up with debris and sawdust. If a blockage occurs, it is easily fixed and cleaned out. Unfortunately, in some situations you may spend more time clearing out the guard, then you would spend cutting. This particular unit is well balanced, which can help to reduce fatigue. A better balanced pole saw, provides better stability and control when cutting. The pole saw is balanced by having the mid-mounted motor positioned between your hands, rather then in front or behind. This enables the motor to effectively function as a counter balance, reducing the amount of effort required to position the pole saw. 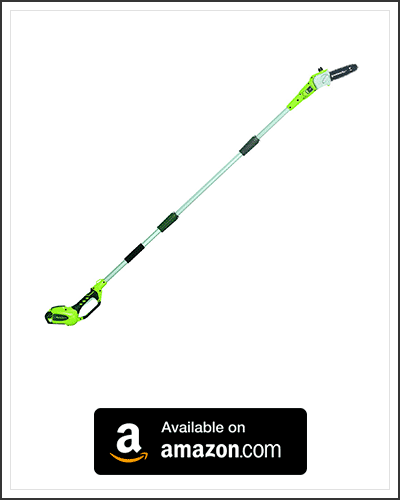 The high torque motor, helps to ensure a quick and clean cut every time. The power to the blade, is transferred with ease and efficiency, making this unit a heavy duty tool with a bit of heft behind it. The Max PS still has a fair amount of weight to it, even with the mid-motor offering better balance. Weighing in at 13.5 lbs, it would be advisable for you make use of the shoulder strap, that is provided with the purchase of this unit. 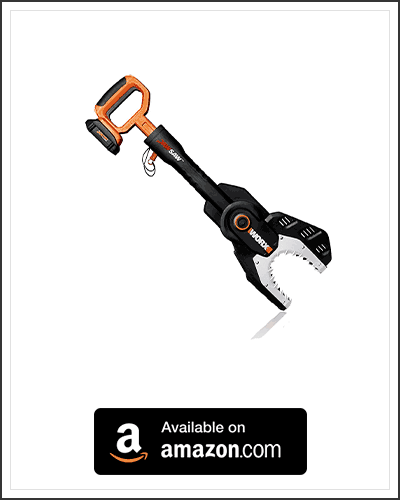 Instead of having to bend over to cut branches into smaller more manageable pieces, you may want to consider using a lopper still chainsaw. The JawSaw makes light work of cutting up kindling, and bunches of branches. By using a longer reaching pole saw to cut off the higher branches, you can quickly cut them to size once they are on the ground. Using the JawSaw to cut branches that are on the ground, does not require you to bend over or kneel down. Simply stand up, position the JawSaw over the branches and push the trigger bar down. The actual chain and bar are shielded inside the unit itself. The claw shaped guard holds the branches in place as the chainsaw is pushed forward and down through the branches. This helps to prevent kick back, and allows you to cut multiple branches at once. By fully concealing the blades behind the safety guard, it makes the JawSaw very safe to use. The risk of accidental contact or kick backs from accidentally pulling the trigger, are greatly reduced. The biggest draw back to using this unit, is that the trigger requires both a squeeze and a push to be able to cut through the wood. Meaning that if you do not have a strong enough grip to count pull while you push, you could end up pushing the branches away from you as you try to cut. The safety guard, while great for protection, does limit the size of the wood you can cut. The bar is only a small one, to allow it room to move up and down inside the safety guard, so it is designed to only cut branches that are up to 3.5 inches thick.